I finally took my Trekking sock on a little trek yesterday afternoon. 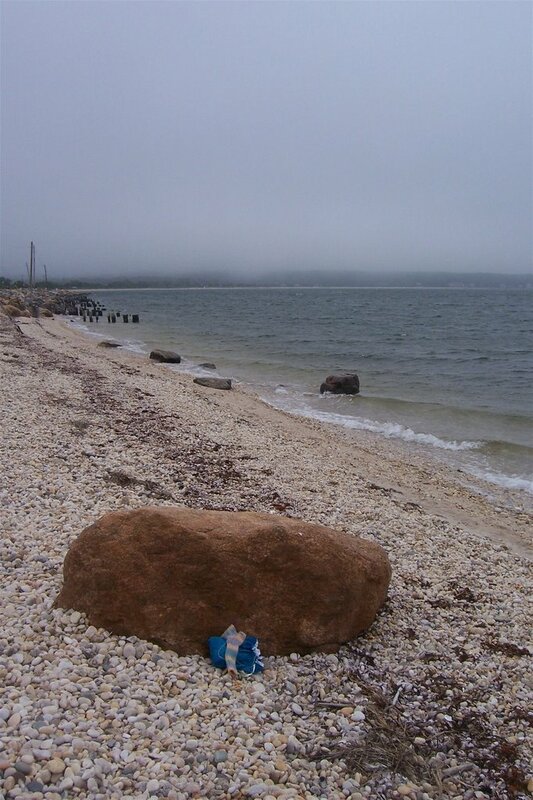 We didn’t get far — just to my favorite bit of bay beach near Sag Harbor. We didn’t stay long either — as you can see, the sock was a bit uncomfortable! The air was so damp and dreary, and the wind was so stiff, that we decided to pack up and head for town and the post office. Here is the intrepid sock, Trekking XXL Color 67, getting out of the wind behind a boulder. It would really rather be inside its special sock bag made by Trek, don’t you think? And here, the increasingly damp and bedraggled sock is being used to gauge wind speed (that would make it a windsock, I suppose). This is not a trick photograph, the sock will have you know! I had to make another trip to the post office this afternoon when I heard that the first Sundara Yarns Petals Collection packages had begun to arrive. The first offering to us fortunate Petals Collection members is “Calla Lily.” When the light is better (in other words, when this two-day-old fog lifts) I’ll take better pictures of the yarn. This will do for now. There’s the yarn, of course, a photograph of Sundara’s inspiration, a little treat, and a Welcome letter. Then there’s the pattern. It’s presented in the most ingenious way — it’s printed on several sheets of card stock, which will make it so easy to read and carry, and it comes in a beautiful mossy-green envelope. The pattern itself looks like it will be a pleasure to knit, too. Its heel is not your usual flap heel, its lace is placed in an unusual way, and its cuff is not your mother’s basic sock cuff. I can’t wait to get started on it! 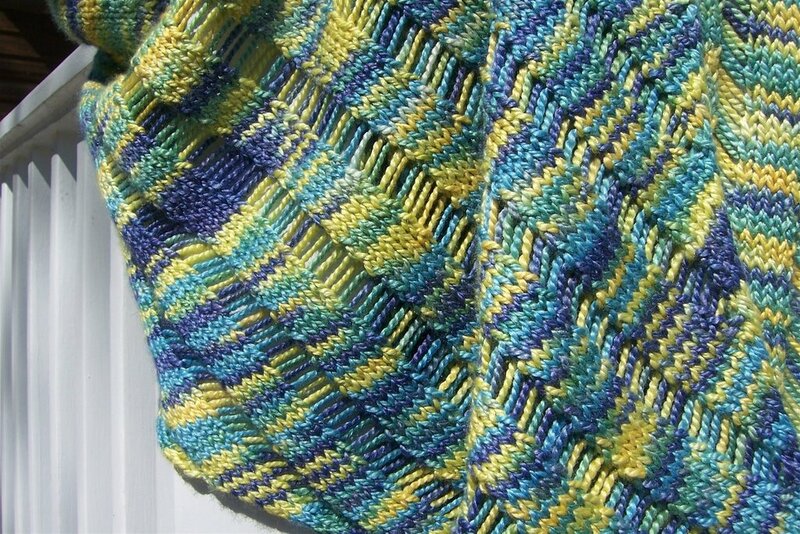 I love Sundara’s yarn — I used her DK Silky Merino for my Sunny Day Clapotis. I’d say it’s been a hard, but good, day all in all. I think I’ve ordered enough of the right books for the big holiday weekend. I have to let it go though, because there’s nothing more I can do until next week. It’s certainly been a stressful day, but having that beautiful package to open, and an evening to smile at it while I work on my Lagoon scarf and my Flower Basket shawl, will do a fine job of unkinking my shoulders. Oh! Before I forget — thanks for all the lovely comments and blogiversary wishes, everyone! Hi there, I’m new to your blog, and I just wanted to say hi and that I love the way your blog looks, so pretty in a not fussy way. Look at that lovely, lovely package from Sundara! Just gorgeous! Weather? Nooooooooo! Please, no more! Love the pics! I took my sock to the beach too – luckily we had better weather 😉 I like the windsock pic! What a great trek – love the pictures! And also the colours of your sock! Lovely post as usual! I love the pictures today, makes me want to do some trekking! Oh my! That Sundara yarn is bee-yoo-tee-ful! 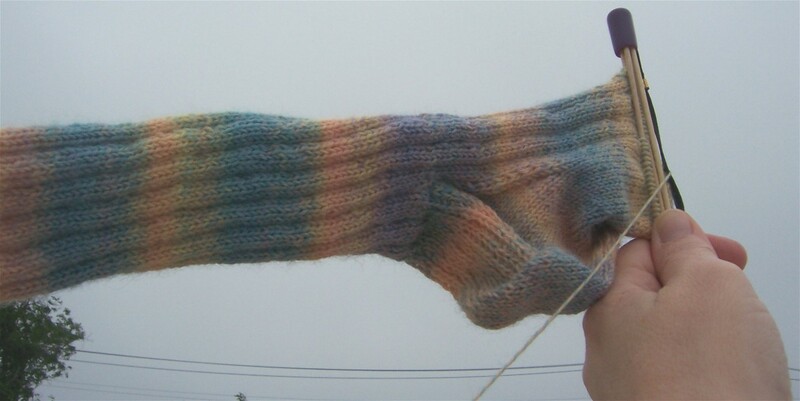 I can’t wait to see the socks you make. Have a great weekend!!! Windsock? You are so funny.Actually it looks like a flag in the pic. I hope your holiday week is smooth and easier than you think it’s going to be. Great pics. of the sock.I have one of Treks sock bags too aren’t they great.That Sundara yarn looks soooo nice!! Ok, the windsock picture is brilliant! And I am SOOOO kicking myself for not joining the Sundara club – gorgeous, gorgeous yarn.Sending you Chaotic Holiday Fortifying Energy(tm) to make it through this weekend!